Studies show that 70 percent of transformation efforts fail to achieve their desired results. Why? Our experience is that leaders don’t holistically create aligned organizations. As a business grows and thrives, it requires adjustments in varying areas of its operation and strategy. It is at these inflection points, that we provide value to clients. Growth necessitates a new way of working together, new behaviors, an adjustment to key processes and support systems, and a new perspective on leadership. Focus. The ability of an organization to establish strategic clarity and distinctiveness in the marketplace. Alignment. 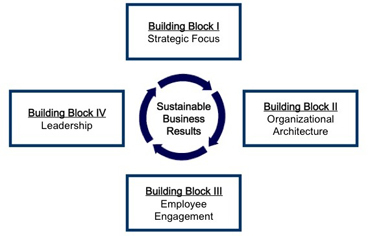 The ability of an organization to align its infrastructure and operations to its focus. Engagement. The ability of an organization to engage leaders, employees, and stakeholders in the mission, and create a culture of execution, trust, discipline, and speed. Leadership. The ability of an organization to develop effective leaders who can lead teams and organizations to achieve significant results. When leaders respect the principle of “fit” through the value chain, they create a whole system of competing that reinforces the competitive advantage identified in the strategy, which makes it more sustainable and harder to imitate. The linkage between strategy, the organization, and the culture of the organization is what truly creates advantage and distinction.